In a large skillet cook bacon slices for about 5 - 8 minutes until just softened, but not crisp. Drain on a paper towel and pat dry to remove excess grease. Set aside. Place the salmon pieces in a bowl with the scallops and add olive oil, lemon juice, sage, salt and pepper. Toss to combine and coat the fish. Cover and refrigerate, tossing once or twice, for about 30 minutes. Preheat a grill to medium. Remove the scallops and salmon from the marinade, and reserve the marninade. Wrap a piece of bacon around the middle of each scallop and each piece of salmon. Using 4 to 6 skewers, thread the seafood onto the skewers, alternating between salmon and scallops. 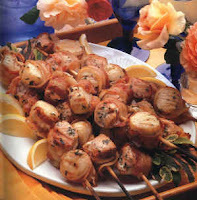 Place skewers on the grill, turning frequently and brushing 2 or 3 times in the first 4 minutes of cooking with the reserved marinade, until the bacon is lightly browned and sizzling and the scallops and salmon are just opaque throughout, about 8 minutes total.